On the day Abdul Karim was martyred, he returned to his home after performing Zuhr prayers at the Kadamtali Jami Mosque and took lunch with his father. Then he left the house due to organizational work. He prayed esha in, the Jahan Mosque of D-block of Shahjalal Sub-City, Sylhet City, in Jamaat. 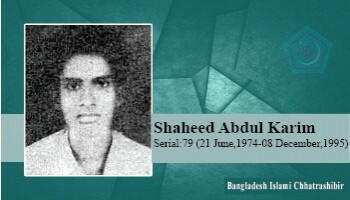 At 10.30 pm, after departing from his colleagues at the organizational work, as he was returning to the house of Kadamtali, he was attacked and killed by Chhatra Dal terrorists at the bridge over the southern side of the Shahjalal Bridge. I do not want to die in general, I want to be a martyr. My greatest achievement will be to be martyred in the way of Allah. Mother, if I become martyred, do not cry, you will be the proud mother of Shahid.